You'll be £16.99 closer to your next £10.00 credit when you purchase The Last Governor. What's this? 1 July 1997 marked the end of British rule of Hong Kong, whereby this territory was passed into the hands of the People’s Republic of China. In 1992, Chris Patten, former chairman of the Conservative Party, was appointed Hong Kong's last governor, and was the man to oversee the handover ceremony of this former British colony. Within the last five years of British rule, acclaimed journalist Jonathan Dimbleby was given unique access to the governor which enabled him to document the twists and turns of such an extraordinary diplomatic, political and personal drama. As Governor, Patten encouraged the necessary expansion of Hong Kong's social welfare system, striving to reconcile the basic rights and freedom of over 6 million people with the unpredictable imperatives of Beijing. Drawing on the insights of a host of senior figures, the author places the crisis in both its human and historical contexts, and presents some startling arguments about the conduct of British foreign policy on Hong Kong before and during Patten's tenure. The Last Governor is highly recommended reading for anyone interested in Hong Kong, Chinese, or British affairs and to readers interested in how bureaucratic politics affects international diplomacy. Dimbleby's prose is brisk and should easily captivate and entrance the reader. Keep in mind that this is not an academic tome, so Dimbleby's point of view is repeatedly expressed without reservation or apology. 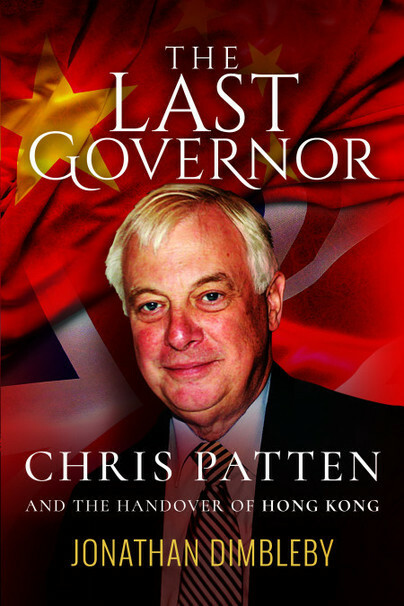 The Last Governor is an encyclopedic account of Chris Patten's governorship in Hong Kong (1992-1997). Dimbleby was given unprecedented access to the inner working of HK Government House, as well as back-stage passes to some of its top bureaucrats. The author's view was very clear and he made no apology for it. Patten's adversaries were often dismissed as "apologists" or "self-proclaimed experts". Despite the author's obvious bias, the book was meticulously researched, engaging and a worthy collection for anyone interested in the history of this part of the world. Dimbleby has donated all the research material, including notes, interviews, tape recordings, to the University of Hong Kong for future researchers. A BBC documentary was made based on the same material. Great insight into what Chris Patten was going through at the time of the final handover of Hong Kong to the Chinese government. Great book about a great man. Well written and personal. Enjoyable read on a flight from Hong Kong to London. I re-read this book after years and years. Its a brilliant insight into politics and the attempt to create a handover using the through train principle which is constantly being derailed or having new track laid. Yes this book is largely patten-centric and the author does acknowledge that and also tries to accept that the Brits could have brought in Democracy in the 150 years that came before. We get reminders of how much Patten was missed by John Major , was he ? Patten treads a fine line and in trying to get a yes-yes solution invariably creates issues around expectations. A fascinating insight into how politics really works and I may now have to watch the Documentary that accompanied this book. I found this very insightful with a lot of background knowledge on the business community of HK going back a bit. Kathy and I were privileged to have lived in Hong Kong for more than a dozen years leading up to the complex events detailed in this book. In 1992, Chris Patten was appointed Hong Kong’s last governor. The first of July, 1997 marked the end of British rule of the territory, and Patten saw the colony passing into the hands of the People’s Republic of China. Setting the episode in both its human and historical contexts, Dimbleby presents some interesting conclusions about the conduct of British foreign policy on Hong Kong before and during Patten’s tenure. First published a decade ago this weighty tome, reprinted this year, documents an extraordinary diplomatic, political and personal drama. Jonathan Dimbleby is an historian and broadcaster, a political commentator and a writer. He also acts as president of Voluntary Service Overseas (VSO), Vice-President and past President of the Campaign to Protect Rural England (CPRE), president of the South Hams Society and is a trustee of Dimbleby Cancer Care.